Bali is a souvenir-collectors dream. It is one of the few places on earth where traditional craftsmanship, whether it be painting, sculpture or carving, is passed down from one generation to the next. It is done with the use of traditional tools and methods and that certainly shows in the end result. I was most impressed with the intricately carved coconut shells sold at the beautiful Gunung Kawi temple site, surrounded by lush palm trees, rice paddies and a volcano view in the distance. Purchase a lovely traditional sarong for yourself at the earliest opportunity, as it will be required for entry to many temples. Balinese breakfasts are filled with mouth-watering banana pancakes, luscious tropical fruit salads and mugs of mild but flavourful fresh Bali coffee. Local food outside of tourist-focused areas can be very hot indeed, so make sure to ask for a mild version at market stalls! One dish that I remember fondly is Nasi Campur: a series of small vegetable and tempeh-based dishes placed on banana leaves around a central red-rice pyramid. It felt like eating a small feast, with all the dishes being quite distinct and differently spiced, definitely something for variety lovers! Bali is a well-known producer of coffee and spices, so if you can, make time to visit a plantation. Your relatives will definitely appreciate the spices you’ll bring home, and you get to try local teas and coffees and check out how everything is grown. This includes the famous (or infamous?) and most expensive kopi luwak coffee, made out of the poo of a civet, a possum-like critter. For the brave and rich only. Ubud is the cultural centre of Bali, a destination recently made famous by Elisabeth Gilbert’s “Eat, Pray, Love,” with lovely restaurants, dance and theatre performances, shadow puppet shows, fashion and jewellery boutiques galore and its very own Monkey Forest. Do buy bananas to feed the naughty macaque monkeys, who offer free daily performances with the use of various props stolen from tourists, from water bottles to hair clips and pom-pom shawls – I witnessed the latter myself, and it was a riot, although perhaps not for the owner of the rather fancy shawl. You don’t want to know what the monkeys did with those pom-poms! Balinese culture is still very traditional and community-oriented. The locals love to chat and if you show genuine interest, will tell you about their belief system, which is closely aligned with the cycles of nature, will happily share with you how they live, and – if you’re lucky to make a friend – show you their house. The houses are quite lovely and divided into separate pavilions devoted to different uses, arranged around a central courtyard which usually features a garden. Politeness and respect for others are highly valued in this country, so losing your temper is unlikely to get you the best result in any situation. Haggling is part of the local culture which follows a different rhythm, so it’s wise to take this onboard and just play along. The best policy is to be informed about accurate prices of items and tours, decide how much you’d like to pay and be fair, gracious and do like the locals do: smile a lot! 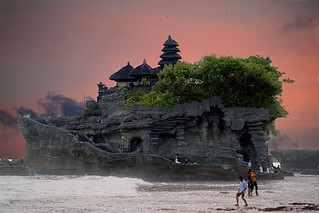 Bali is a different world compared to the rest of Indonesia, maybe because of the tourism it receives each year. Do you recommend any special dates to go and visit the island?